Nowadays number of health problems are there. Many of people are not aware about rare diseases. Some of the health problems are related to immune system. In that case problems arises because the body's own immune system attackss its own tissues. These conditions are known as Auto Immune Reactions. Henoch Schonlein Purpura is one of such reaction. In this article we will discuss about this problem in detail and its Ayurvedic treatment. What is Henoch-Schonlein Purpura (HSP)? It is also known as Anaphylactoid Purpura. It is inflammatory condition in which immune system is disturbed which may be due to infection or some medication. It is a form of inflammation of small blood vessel or Vasculitis. When inflammation of blood vessels occurs it is known as Vasculitis and when these vessels get inflamed and bleed, then rashes are formed and it is known as Purpura. This disorder causes inflammation of small blood vessels, kidneys, joints and intestines. It is characterized by purplish rashes on lower legs and buttocks and it may also cause abdominal pain and aching of joints. It may affect any age but it is more common in children. 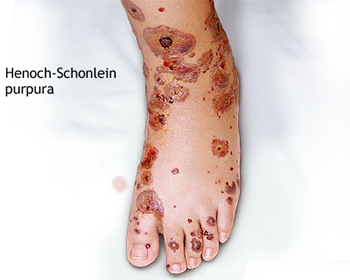 What are the causes of Henoch-Schonlein Purpura (HSP)? HSP is the problem of immune system which commonly occurs after previous infection. It is the most commonly occurring problem in spring season and follows infection of respiratory tract such as cold. In this condition, immune system is activated to produce antibody named IgG which mainly targets blood vessels and causes inflammation of blood vessels. This condition is called Vasculitis. Other causes may include drugs, food or insects. Skin rashes or Purpura: The most common sign of HSP is appearance of reddish purple spots mainly on legs, buttocks and arms. Inflammation and pain in joints or Arthritis: Pain and inflammation of joints mainly in knees and ankles is most often seen in patients suffered from HSP. Gastrointestinal symptoms: The symptoms associated with gastrointestinal tract are sometimes seen before rashes such as abdominal pain, vomiting, nausea, bloody stools. Kidney problem: In rare cases, kidneys are also affected. In that case, there is presence of protein or blood in urine. Blood test: It helps to diagnose the infection in blood and people who have this problem, there is increased level of particular antibody in blood. Urine test: It helps to check the presence of protein or blood in urine, which is the sign that kidneys are affected. Blood pressure: High blood pressure is also a sign of kidneys being affected. Skin biopsy: In this a piece of skin is analyzed to diagnose the problem. There are three main energies (vata, pitta and kapha) in the body which are responsible for good health. Imbalance of any three results in health complications. As per Ayurveda, HSP is due to imbalance of pitta in body which results in vitiation of rakta dhatu and mansa dhatu. Treatment of HSP mainly focuses on the pathology of disease. 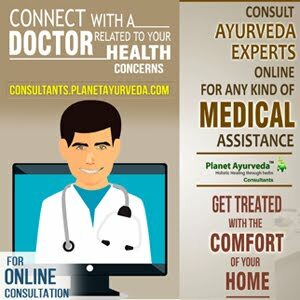 Ayurvedic treatment aims at reversing pathology of disease as well as giving treatment for the associated symptoms. Herbal medicines have a specific action on blood vessels. These have soothing and anti-inflammatory action on blood vessels as well as other inflamed tissues in the body. These medicines also give strength to connective tissue in the damaged part of body. In addition to these, herbal medicines also have property to enhance the immunity of body so as to control the symptoms associated with the disease such as rashes, inflammation, itching. It also prevents the recurrence of disease and also prevents the vital organs such as kidneys. 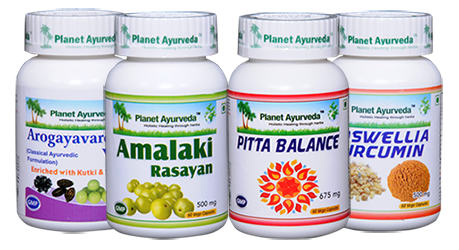 Planet Ayurveda is a herbal manufacturing company which offers 100% herbal formulations to treat HSP. These are obtained from herbs and free from chemicals and preservatives which are safe for use. Praval pishti (Coral calcium): It is found at sea bed which is rich source of calcium and helps to balance pitta dosha. Akik pishti (Agate calcium): It has property to balance the vata and pitta doshas in body. Jahar mohra pishti (calcium compound): It is also a good source of calcium which is helpful in GIT problems. Kamdhudha rasa (calcium compound): It keeps the digestive system healthy by balancing pitta dosha. Mukta pishti (Pearl calcium): It is very effective against aggravated pitta conditions like indigestion, acidity and heart burn. Giloy (Tinospora cardifola): It helps to balance all three doshas of body and enhances immune system of body therefore it provides complete health. For adults: 2 capsules twice daily, after meals with plain water. For children: 1 capsule twice daily, after meals with plain water. Uses: These herbs are packed with various health benefits. It supports the healthy digestive system, immune system. It is good for indigestion, lack of appetite. It helps to balance all three doshas in body. For adults: 2 tablets twice daily with lukewarm water after meals. For children: 1 tablet twice daily with lukewarm water after meals. It is one of the best herbal formulation having anti-inflammatory properties which are obtained from Shallaki (Boswellia serrata) and Curcumin (Curcuma longa). Shallaki (Boswellia serrata): It is herb which has anti-inflammatory terpenoids called Boswellic acids. It is useful in various inflammatory conditions. It also prevents the breakdown of tissues. Curcumin (Curcuma longa): It has wide range of therapeutic value and used in different herbal formulations. It has different medicinal properties such as anti-inflammatory, anti-oxidant, anti-viral and anti-bacterial properties. These are pure herbal capsules which are obtained from extract of Indian Gooseberry (Emblica officinalis). Uses: This herb has great medicinal value which is used from long time in Ayurveda and is packed with various properties like being effective anti-oxidant and anti-inflammatory.